How do you Measure Color Accuracy? The vast majority of the human population is extremely sensitive to differences and inconsistencies in color. Intuitively, we are able to sense when a color is ‘off’. However, when it comes to scientific equipment and color sensors like the Nix Pro and Nix Mini, it becomes necessary to determine the accuracy in mathematical terms. Color can be precisely described in several different co-ordinate systems, such as XYZ, RGB, CYMK, or L*a*b*. In these systems, different values are assigned to variables like L*, a*, and b*. 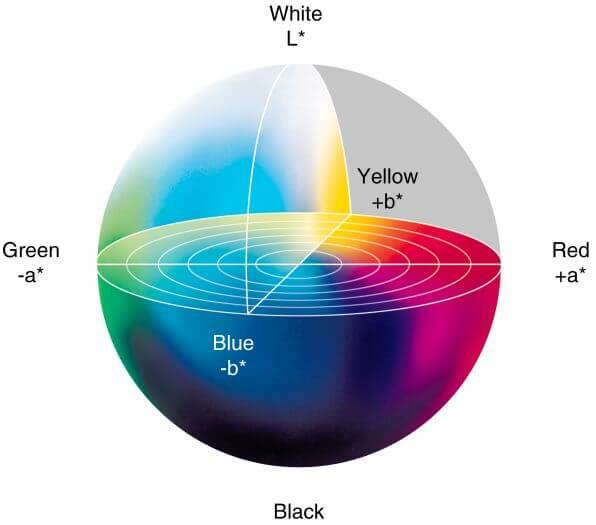 In particular, the L*a*b* system can be plotted as a sphere that contains hundreds of thousands of different colors. Each color has its own unique point within the sphere. In order to calculate the difference between two colors within the L*a*b* system, all you need to do is calculate the distance between their respective points in the sphere. From a mathematical standpoint, this is essentially trigonometry (here’s the Wikipedia article for the nerds out there). 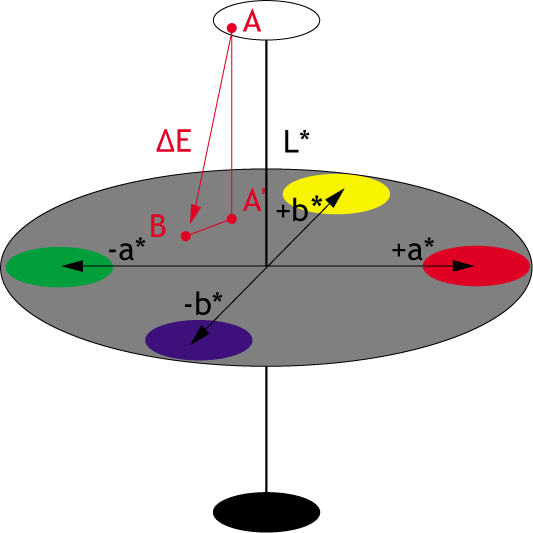 The distance between two colors is known as the Delta-E, and is an industry standard that is overseen by the International Commission on Illumination. 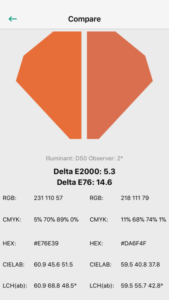 From a practical perspective, the average human eye cannot detect any color differences with a Delta-E value of 3 or less, and an exceptionally trained and sensitive human eye will only be able to perceive color differences with a Delta-E of 1 or above. 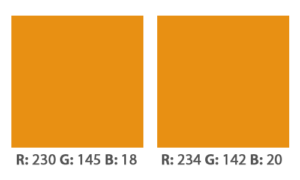 To give you an idea of how different Delta-E values actually appear in real-life, we created the following sets of color swatches. Note that the quality of your monitor or smartphone might affect your ability to perceive these colors properly. With a Delta-E this large, the two colors are clearly different from one another. Even with a relatively large Delta-E of 5.65, these two color swatches aren’t incredibly different from one another. Delta-E values of around 3 represent the limit of most people’s perception. It may take a second glance to realize that these are two different colors. To the average person, these two colors will appear to be the same. Only a few people reading this will be able to detect any difference. The Nix Pro Color Sensor is capable of comparing between color samples to determine the Delta-E difference of two colors. This can be used on production lines, print proofs, and industrial processes to ensure color accuracy quickly, cheaply, and effectively.